Probus, his radiate and cuirassed bust right. Emperor galloping right, spearing enemy whose shield lies beneath horse. KA dot A dot in Exergue. 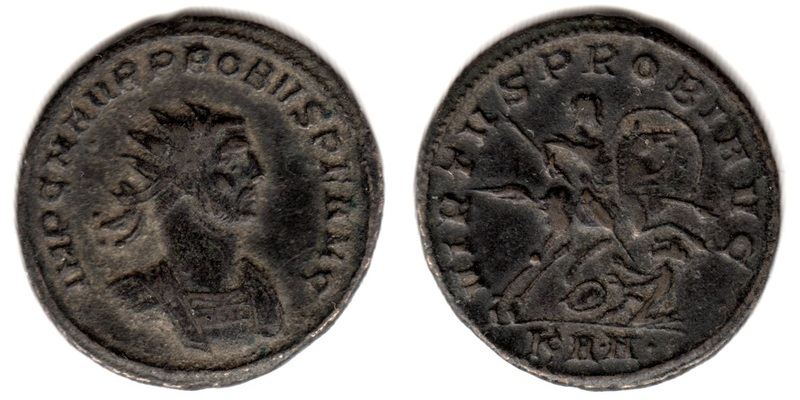 Minted at Serdica (Sofia, Bulgaria), 4th emission, 1st officina in 277 A.D.
Webb, P.H., "Roman Imperial Coinage", Volume 5, Part 2 (RIC), p113, nr. 877, bust type F.
Van Meter, D., "Handbook of Roman Imperial Coins", p262, nr 60, var with Ol/6.